Meth mouth refers to a severe tooth disorder that is due to chronic Amphetamine addiction. Regrettably, it does not spare your gums either. If you choose not to give up the habit, it may lead to other complications. Addicts, as well as caregivers, often overlook Meth mouth. Though it is a well-known and common side-effect, it doesn’t attract as much attention as other effects. Nevertheless, you should seek immediate treatment as soon as you notice the signs. Methamphetamine or meth is a stimulant medication that is available only with a doctor’s prescription, which is usually used to treat ADHD. Due to its addictive nature, a significant number of people abuse it leading to various side effects. Meth abuse raises the risk of overdose and causes heart disorders, stunted growth (in young abusers), psychosis, skin rashes, etc. Unfortunately, it is much more common for meth to be used as a recreational drug than as a medication. Though it’s been used to help with severe cases of ADHD and narcolepsy, it is much more common among addicts. In 2012 alone, 1.2 million people in the United States admitted to using meth within the past year, according to National Survey on Drug Use and Health (NSDUH). Considering meth’s highly addictive properties the probability that a large amount of those who have tried it end up addicted is extremely high. Meth can be taken in a couple of different ways. It can be snorted, injected, swallowed or smoked. Smoking is the most dangerous form of ingestion due to how fast the drug hits the bloodstream and brain. It may be too late to know you’ve smoked too much. It is also most damaging to teeth because methamphetamine itself is acidic. So not only are the side effects of the drug conducive to poor oral hygiene but the substance itself ingested through the mouth damages it on contact. Unfortunately, this journey does not take more than a year after you start abusing meth. Would you like to smile again? Give up the addiction right now. 96% of Meth users have tooth cavities, and one-third of them lose six or more teeth. A 2015 study published in The Journal of The American Dental Association (JADA) confirms this. Failure to treat the early signs may lead to permanent tooth loss. In fact, many addicts have to wear full dentures for the rest of their life. Dryness of mouth due to chronic addiction is the main culprit behind Meth mouth. When your mouth becomes excessively dry, the acid levels inside the mouth skyrocket acting on the teeth and eating them up. Poor oral hygiene further deteriorates this. Consequently, you end up losing your teeth along with your smile. Researchers also suggest that prolonged periods of dry mouth increase your cravings for artificially sweetened drinks. Due to this, the tooth destruction process becomes even more aggressive. What are the Effects of Meth Mouth? Needless to say, the loss of teeth is the most visible sign indicating the ill-effects of meth mouth. If you are lucky enough and manage to retain them, they will most likely be rotten. Other complications may include lesions on the inner surface of the mouth, prevalent gum diseases, and teeth grinding (Bruxism). Some patients who have abused it for prolonged periods are found to have difficulty chewing food. This may occur due to an increased rigidity of the muscles in the mouth. What Does Meth Mouth Do To Your Teeth? There is a certain order to how meth affects your teeth, causing irreversible damage in as short a period as a year. First, you may notice staining, where your teach begin to change color. Next comes decay, which is when you may notice your teeth slowly changing shape and eventually falling out. Missing teeth is part of the image associated with meth use, unfortunately. This process does not take a long time and there is nothing you can do to prevent it other than quit meth use. That is just the direct effect of the drug on your teeth. The side effects of meth go hand in hand with the drug to create a dangerous environment for your teeth. Due to the high people experience, which involves hyperactivity and fast thoughts, it is not uncommon for people to neglect their hygiene altogether, as it simply is not a priority while under the influence. Brushing your teeth is not high on the list while on meth. With a meth high lasting anywhere from 8-24 hours, and users often chasing away withdrawal symptoms with another dose, it is not uncommon for your teeth to go ignored for days. Another side effect of meth can be anxiety, paranoia, and stress which for many results in a habit of grinding their teeth or clenching their jaw. This can cause further damage. And lastly, the dry mouth effect of meth often leaves users craving sugary beverages to quench the thirst. As may be expected a healthy and nutritiously balanced diet does not often go hand in hand with a meth addiction as well, leaving addicts lacking nutrients to help fight for oral health. If you smoke or eat tobacco, or abuse other drugs, the risk of such complications goes up by a huge margin. Regrettably, many abusers are habitual smokers or tobacco users. 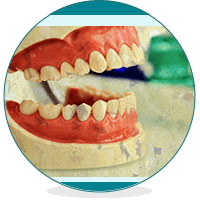 As a matter of fact, the first thing you can do to salvage your teeth is to stop using meth, which might not be possible if the addiction has already taken charge of your body and the mind. For this reason, consider seeking professional help to start the detox process and rehabilitation therapies. Schedule an appointment with a dentist. Then, communicate clearly about your condition and expected outcome. Make a list of questions to ask and take note of what they suggest. Maintain proper hygiene by brushing regularly. Also, avoid sugar-loaded foods or drinks. Get the damaged tooth removed through surgery if your dentist recommends it. Ask them if fillings or dentures could be options. If you have problems with teeth grinding, wear a mouthguard. Where to Seek Help for Meth Addiction? Stopping the abuse not only protects your smile but also offers you a happy and sober life. If you want to know more about Meth addiction, meth mouth or any other type of dependency, talk to the experts. Addiction counselors can suggest ways for you to fight addiction and help you come out clean. Rehabilitation centers have a team of qualified health professionals who can make your journey to sobriety swifter and easier. To know more about the addiction/rehabilitation centers near you, click here. Hi My Son is 30 years old and it is confirmed he is addict to meth. He has the trait signs of meth mouth-his teeth need the gum line is black. So for the first step we need help in getting his clean and corrective measures for this teeth. Thank you for this article. I cannot thank you enough for this article. It is precisely what I needed to know for myself. I’ll take action and call a dentist tomorrow! This article is very helpful. Though from what I’ve seen from family experience that some can maintain their teeth and hygien and it’s confusing on that part. What are other sure fire ways to tell? I’m just a reader here like anyone else, but research points to pattern of use as the reason behind this observation that some experience meth mouth and others may not. I don’t want to get into the complicated reasons why, but suffice it to say that prolonged use at a frequency of every 12 hours or so daily is the most dangerous dosing schedule in terms of your oral health. Those who use sporadically with a larger interval between their “highs” will likely see far less damage or for that matter, any at all which is sometimes the case with episodic users that see many days or weeks between meth highs. Unfortunately, as many well know, such periodic use is difficult to maintain and ultimately those escaping the scourge of meth mouth can not expect to be so lucky forever. As soon as the day comes that they begin using on a daily basis and they come closer to use every 12 hours or less, the sooner they will begin to see problems. A under appreciated factor that research shows is involved with meth mouth, reduced circulation to critically important structural components in your mouth due to the vasoconstrictive effects of the drug, is not going to change no matter how great a user’s attention to oral hygiene. I have seen young adults from abusive home environments who have never brushed their teeth with every tooth intact. If you stop all attempts at oral hygiene today, and a friend starts meth use on a daily basis but brushes after every meal, the one with the real problems a few years down the road will not be you. The difference lies in vasoconstriction. In your mouth are vessels so narrow that red blood cells must move thru at single file. Meth has vasoconstriction effects that will prevent blood cells from passing for up to 12 hours. If meth is present every day, these tissues are going to die from oxygen deprivation. And no matter how much you care for your teeth, if the support structures aren’t getting oxygen, you will lose those teeth. There is another area that has vessels small enough to be effectively shut down by meth. These are in the cerebral cortex of the brain. If a user is seeing meth mouth signs, they are likely seeing tissue death in the brain as well. It is extremely important, therefore, to manage the pattern of use. If one can not quit, perhaps letting some time pass between highs would be far better than brushing and flossing teeth that are suffocating and continuing daily meth use. I don’t suggest one skip oral hygiene efforts at all. I merely suggest that we realize that if shoddy hygiene were the culprit, this would not be called “meth mouth” because it would be happening far more commonly than it is seen as a consequence of meth use alone. You would be seeing it in high school among people who have never seen meth. These are multifaceted problems and the causes are complex across environmental factors and time. In the end, were I concerned about oral hygiene, I’d rather swear off brushing my teeth for 3 years than go on a 3 year meth binge and perfect oral hygiene and, in the end, I might be glad I did. The reader should quit meth, see a good dentist and follow his every word. Because the only unquestionably effective response to meth mouth is a commitment to both. Well I guess I did exactly what I said I wouldn’t. Sorry about that. You will be fine, you more than likely will not see any short term effects for being a first and hopefully one time user. Just dont ever use it again and you’ll never have to worry about the effects. For first time users, the main concern is starting the addiction.